HAMMONDSPORT, NY. (July 30, 2015) – Coming off a solid performance at New Hampshire Motor Speedway and Iowa Speedway, K&N Pro Series East Championship contender Scott Heckert heads into next Friday’s race at Watkins Glen International Raceway with momentum and a brand new sponsor. Hammondsport, NY based Bully Hill Vineyards will adorn Heckert’s No.34 HScott Motorsports with Justin Marks Chevrolet. Bully Hill Vineyards has served as a primary sponsor of several NASCAR teams and races over the past 15 years and continues to be a major supporter of Watkins Glen International Raceway. 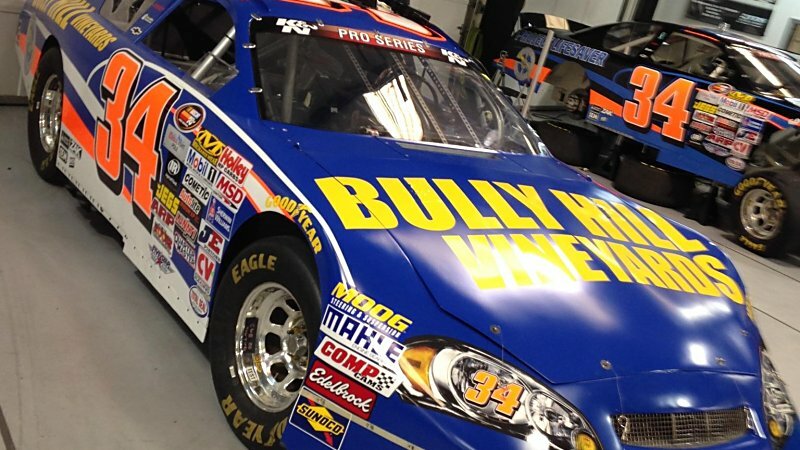 Since the mid-90’s Bully Hill Vineyards have sponsored events such as the NASCAR XFINITY Series, the NASCAR Featherlite Modified Series and the NASCAR Camping World Truck Series. Bully Hill Vineyards, has also sponsored several drivers including Eric Bodine, Ron Fellows, Joe Nemechek, Elliott Sadler & Cole Whitt. Bully Hill Vineyards is a winery located in Hammondsport, NY, in the beautiful, Finger Lakes Region. Bully Hill Vineyards is a family owned producer of 40 different wines, all from grapes grown in New York. Currently, Bully Hill Vineyards produces 200,000 cases of wine annually, with distribution in 30 states. HScott Motorsports with Justin Marks is a full-time, multi-car NASCAR K&N Pro Series East team. Based in Mooresville, N.C., HScott Motorsports with Justin Marks is co-owned by NASCAR Sprint Cup Series and Xfinity Series car owner Harry Scott Jr. and entrepreneur and driver Justin Marks. The team, which fields five entries, has won six of eight NASCAR K&N Pro Series East races so far this season. For more information on HScott Motorsports with Justin Marks, please visit www.hscottmotorsports.com.